JAKARTA, Indonesia (AP) — The sun had just slipped behind the mountains, leaving a soft pink glow as the blue sea melted into the darkening horizon. It could have been a video postcard from a tropical paradise, except for the long white wave stretching the width of the bay — getting larger and closer with each passing second. By the time the fast-moving wall of frothing water slammed into the city of Palu off Indonesia’s Sulawesi island on Friday, it was 3 meters (10 feet) high. The tsunami, triggered by a magnitude 7.5 earthquake, destroyed the idyllic scene in seconds, leaving hundreds dead. The video clip, shot on a smartphone and widely broadcast Saturday on Indonesian TV, showed water swallowing an entire row of buildings and gushing into streets and a damaged mosque as onlookers ran in terror. Photos showed twisted tin and wood splinters floating in the coffee-colored torrent alongside cars and motorbikes that had been tossed like toys. A shopping mall was reduced to rubble. Images also showed bodies draped in crude blue tarps on roads near the beach, while others were laid out in rows on concrete foundations. One man carried a dead child through the debris. Experts said the long, narrow bay running into Palu, a city of 380,000, squeezed the tsunami into a tight space, likely making the waves more dangerous. 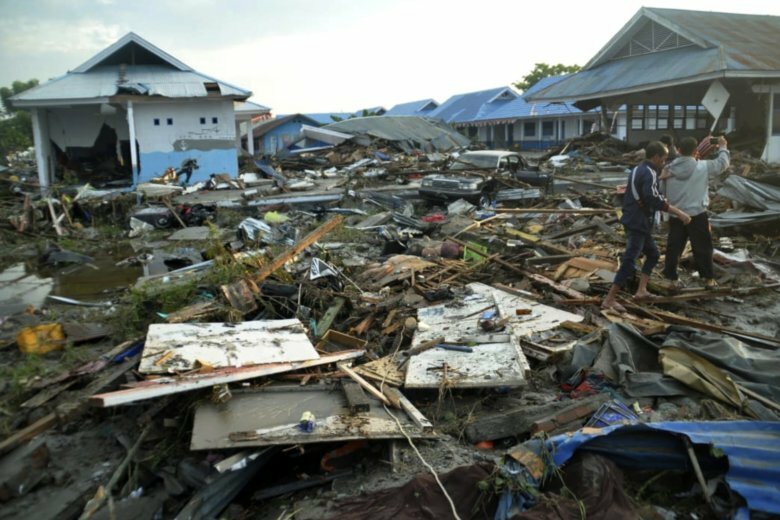 Officials said more than 380 were dead in Palu alone, and more were unaccounted for. “Because of the bay, all the water comes there and collects together. And then it makes it higher,” said Nazli Ismail, a geophysicist at the University of Syiah Kuala in Banda Aceh on Indonesia’s Sumatra island, where a magnitude 9.1 earthquake spawned a tsunami in 2004, killing 230,000 people in a dozen countries. Disaster agency spokesman Sutopo Purwo Nugroho said the waves reached as high as 6 meters (20 feet) in at least one area, according to a report relayed by a man who called to say he survived only by climbing and clinging to a tree. The cities of Donggala and Mamuju were also hit, but they had not yet been reached. Roads were impassable, cut off by debris and landslides, and communications were nearly impossible. Hospitals in Palu were swamped with patients lying on the ground hooked to drips. One woman was about to give birth. They were being treated outdoors due to continuing strong aftershocks, and many residents in the area were also sleeping outside, too afraid to return indoors. The city was eerily dark and quiet with no electricity and not even landline phones working. A massive yellow suspension bridge crossing an estuary feeding into the bay was toppled — either by the earthquake or tsunami — and left lying on its side in the water. Ismail said he was surprised that a tsunami was generated off the coast of central Sulawesi, which sits on a strike-slip fault, producing earthquakes that typically move in a horizontal motion and do not usually displace large amounts of water. In contrast, temblors occurring where one tectonic plate is lodged beneath another — called subduction zones — can move large amounts of water vertically when the strain forces one plate to pop up or dive down. The force can create devastating tsunamis like the one in Sumatra and off Japan’s northeast coast in 2011. But Danny Hilman Natawidjaja, a geologist with the Indonesian Institute of Sciences, said the Sulawesi event is more complicated. While it occurred on a strike-slip fault, he said the part that ruptured was on a small segment that can move in a vertical motion. He said that could have triggered the tsunami, which also could have been created by an underwater landslide. Indonesia, a vast archipelago of more than 17,000 islands, is prone to earthquakes because of its location on the “Ring of Fire,” an arc of volcanoes and fault lines in the Pacific Basin. Associated Press writer Niniek Karmini in Palu, Indonesia, contributed to this report.